The Striper are best caught early in the morning: in the summer we like to start our Percy Priest Striper Guides trip around 4.30-5am. That gives us 4-5hrs of fishing before they slow down around 10am. We start out catching our own fresh bait right on the lake using a cast net. The livelier, the higher the likelihood of a Striper biting! Our favorites are Threadfins and Gizzard Shad that we keep alive and kicking in a special bait tank that we bring along just for this occasion. 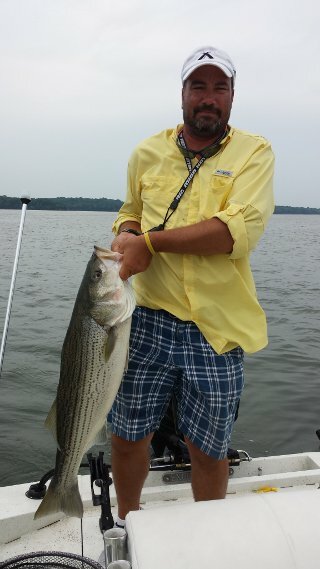 It is not only the traditional big Striped Bass that we target on our Percy Priest Striper Guides trips, but also hybrid Stripers also known as Cherokee Bass that are just as large and as much fun to catch. What’s the action plan for the day? After filling our bait tank, we generally head out to one of our favorite spots, like near Hobson Pike bridge at the lower end of the lake or around the 7 Points Landing area trolling down the bluff wall – just to name a couple. Just like every fish, the Striper patterns vary from day to day as well as season to season. However, over the years we scouted out where they run in which weather conditions. So if they travel out of the areas we usually know them to be in, we’ll do everything we can to locate them. Whether we’re trolling with umbrella rigs, throwing bucktail jigs with 6 inch chartreuse twister tail or using the live bait: we’re sure to apply a technique that’ll work best on your day with the Percy Priest Striper Guides. Our guarantee is that whether we have one rod or five rods go off at the same time: hauling these beasts in will be a blast! And as always: our client has the option to keep or release the fish.